After the well publicised reduction in FIT rates for new applicants at the end of January, the rate of installations in the domestic market has dropped substantially. The most recent report from the MCS organisation shows that as of the end of March, there were 2,300 registered MCS installation companies. The government is using that number to claim that the renewables sector is still strong. What they have not highlighted is the net reduction in the number of installation companies over the 3 month period to end march which is approximately 1,000. The rate of companies closing or dropping out of the industry is under-reported and not slowing down. This means that if the trend continues, there will be next to no renewables companies left in 6 months time. That is not a good position for the UK to be in as we continue to try to improve our energy supply resilience and costs. H2ecO has highlighted this issue to the MCS and our local MP Michael Tomlinson (Conservative) and we wait to see what response we get. In our local area, most of the companies we routinely competed against for business have liquidated with AP Chant of Bridport, Apple Solar, NGPS Ltd and Save Energy Group being just part of the list. H2ecO is surviving because we have low overheads, own our own premises and are service Partners with Daikin which is allowing us to continue trading and offering support and service to our existing customers. The good news is that the general media reporting on PV has led the public to believe that FIT’s have finished or are not worth considering anymore. This simply isn’t the case and a 10% return on the cost of a system is still realistically achievable. That is the same situation as existed when we started the business 6 years ago. The problem is trying to get that message out to the wider public. We hope our existing customers are still willing to recommend us to potential new customers safe in the knowledge that they are still recommending a reliable installer and that the finances do still make sense – along, of course, with the difficult to quantify feel-good factor of saving carbon emissions and not being quite as dependent on the big 6 energy companies who we expect to put prices up again towards the end of the summer using the oil price increase as an excuse (even though their pricing did not track oil down very well!). H2ecO is still offering a £100 referral fee to any existing customers for installations that go ahead. There has been a lot of discussion about battery storage in the media recently. Battery storage is the holy-grail, aiming to solve the ongoing conundrum of how to make best use of PV production which happens during the middle of the day when the maximum demand tends to be early and late. Companies like SolaX have been producing and selling inverter/battery systems for a while to help deal with these issues and maximise the benefits to end-users. At H2ecO, we have been keeping a keen eye on the options and have recently become one of the first certified Tesla Powerwall battery system installers in the area. We completed our first installation a few weeks ago and early results are excellent. The battery is being pretty much fully utilised every day. It is shifting over 7kWh of electricity for use by the client, as opposed to that electricity being exported with no financial benefit. If that continued for the whole year, the savings would equate to roughly (365 x 7 x £.16)= £409. The Tesla systems currently cost about £4300 inc vat for customers who already have a Solar Edge Inverter. This equates to a return on investment of about 9%. The batteries are guaranteed for 10 years and should last much longer. The Tesla Powerwall offers far superior performance to a base SolaX system with a 2 kWh battery. SolaX batteries charge quickly in the morning but tend to discharge by around 1am in an average 4 bedroom house. Of course the SolaX battery system can be upgraded by adding extra batteries to get the system capacity up to 6 or 8 kWh. If you have a solaX system that is cycling too fast, H2ecO can help look at options for adding battery capacity to the existing system. This would not be necessary with Tesla; the larger capacity of the Tesla Powerwall means that it can supply electricity long after other systems would be fully drained. In the last week, we were called to troubleshoot a SolaX system installed by a local company that has gone bust and found that the battery system had not been configured correctly for over a year and had not charged or discharged during that time. A 2 hour site visit sorted the problem and the system is now working very well with the battery cycling once or twice during the day – as it is a smaller 3.6kWh unit. If you have an existing battery storage system make sure it is working efficiently; give us a call on 01202 918486 to arrange a service. At H2-ecO we are very excited to have won at the South West Energy Efficiency Awards for Regional Renewable Heat Installer of the Year! In 2016 we have been nominated for a total of four regional and national awards. At the South West Energy Efficiency Awards we are nominated for the best Regional Small Scale Project for our work for the Anglo American Oil Company, the Regional Renewable Heat Installer of the Year, and our director Mike Stevenson as the Regional Energy Efficiency Champion. Winning Heat Installer of the Year is a great privilege and testament to the hard work and drive of the whole H2-ecO team. We are also very pleased to have been nominated for the national ‘Installer of the Year’ at the British Renewable Energy Awards. Read on to learn about why we were nominated for this top award. Julie Stephenson has run H2ecO for nearly 5 years as a small renewable energy installation company in Dorset. She has seen the company expand and contract with the vagaries of the various incentives and changes in governments. The company has varied in size between 12 and 3 staff and has weathered the financial difficulties typical of her industry. H2-ecO has had years that are profitable and years that are loss-making. What has not changed during those years is her commitment to truly excellent customer care. The requirements of RECC and the MCS are largely irrelevant as she always ensures that the standards H2ecO applies are well above the minimum requirements. WHICH registered for 3 years, most recommended company in Dorset on Yougen for companies that are not using feedback gained by other companies work, and with hundreds of installations to the companies name. She keeps the company going even faced with very difficult trading conditions for a company that doesn’t break or even come close to bending the rules on sales and marketing of renewables (something we find rare in the real world). H2ecO recently installed a full package of renewables to a new-build commercial building inc PV, UFH, Heatpump, Heat recovery ventilation and Heat recovery aircon. This was at the clients request and required lots of work with the main contractor who did not think it was normal or likely to be feasible to apply those thechnologies to a “typical” new shed building. The system has worked flawlessley and would make a very good case study for the adoption of those technologies into standard “shed” construction light commercial/industrial units. Recently becoming service partners with Daikin and Panasonic to help provide a baseline of work for H2ecO’s staff – so the company can be kept running. Julie wants to ensure that her existing clients will be looked after properly by H2ecO into the future rather than take the currently easy option of voluntary liquidation to shed all previous liabilities in terms of warranties etc – as we see a lot of other renewable installers doing. If for nothing else than sheer determination to keep the company running in the face of extremely difficult trading but with the same exceptional standards of customer care as always, she and her installation team deserve recognition. We were proud to have been nominated for the Regional Small Scale Project of the Year at the South West Energy Efficiency Awards, for our work for the Anglo American Oil Company. Read on for an overview of the project. 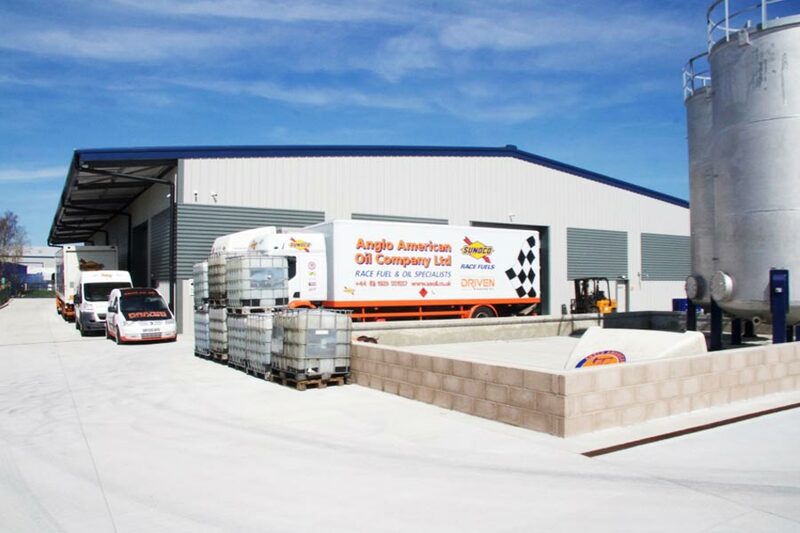 Anglo American Oil Company is a company specialising in oils and fuels for motor racing and small engines. It recently introduced a new fuel that massively reduces harmful emissions in two-stroke machinery, typically for horticulture and forestry applications. The Anglo American Oil Company has set up its main offices and warehousing in new buildings on ex-MOD land near Poole in Dorset. The Swedish Managing Director/owner wanted the offices and workshop to be heated and cooled as comfortably, efficiently and in as environmentally friendly a way as possible – without sacrificing any of the qualities expected in a contemporary new-build project. 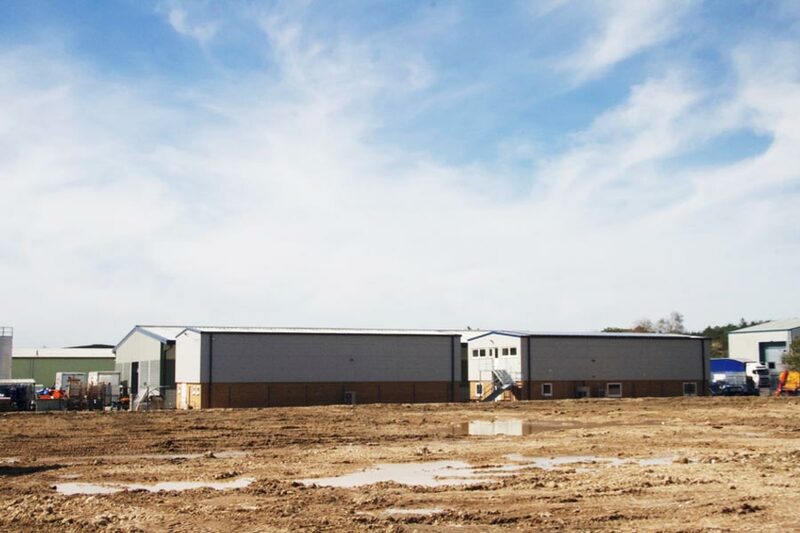 The main contractor, Jade Aden, is a very well respected local developer with a long track record of building top quality commercial properties. The Anglo American Oil Company buildings in question are the main offices, running to 342 square metres across 2 floors and a workshop/laboratory of 171 square metres. A large adjacent warehouse is unheated and outside the scope of works. Maximum use of renewable sources for the energy requirement . Particular consideration was to be given to creating a work environment that promoted high levels of productivity in the office area – so temperature control and air quality were key. The main contractor did not have experience of a brief as specific as this and H2ecO was brought in by the client approximately three months before planned completion. The main building fabric design had already been fixed and was fortunately already to a high standard of U-Value. Typical entire-site electrical load in normal daytime operation was estimated at 30kW. The client wanted to avoid any requirement for a mains gas connection. Based on personal experience in Scandinavia, the client wanted underfloor heating for both the office and the workshop. Office Heating and cooling whilst remaining RHI-eligible? Maintain a healthy, productive workspace. Underfloor heating in a workshop with structural high load slab. Being ’imposed‘ on the main contractor by the client. Minimising demand from the grid. 1. Office Heating and cooling under the RHI. At a very basic level, heating is best done from the floor as heat rises and cooling is best done from the ceiling as cool air sinks. Radiators round the perimeter of large offices create very patchy temperatures with over and under-heated zones. Both from a comfort and efficiency point of view, UFH is optimal – but not normal in UK commercial steel-frame buildings. Technologies also capable of cooling are not allowable under the RHI so the use of, for example, Daikin VRV IV Heat Recovery air conditioning systems alone was not possible due to their ability to heat and cool at the same time. A solution that used an RHI eligible heating-only technology interlinked with a heating and cooling technology was the end result. H2ecO opted to use all-Daikin equipment to maximise compatibility but there was no off-the-shelf solution to achieve what was required. In collaboration with the Daikin UK design team, a system utilising a 16kW Daikin Altherma Low Temperature heat pump to provide whole-building heating via in-slab underfloor heating was specified – in conjunction with a whole-building Daikin VRV Heat Recovery air conditioning system. 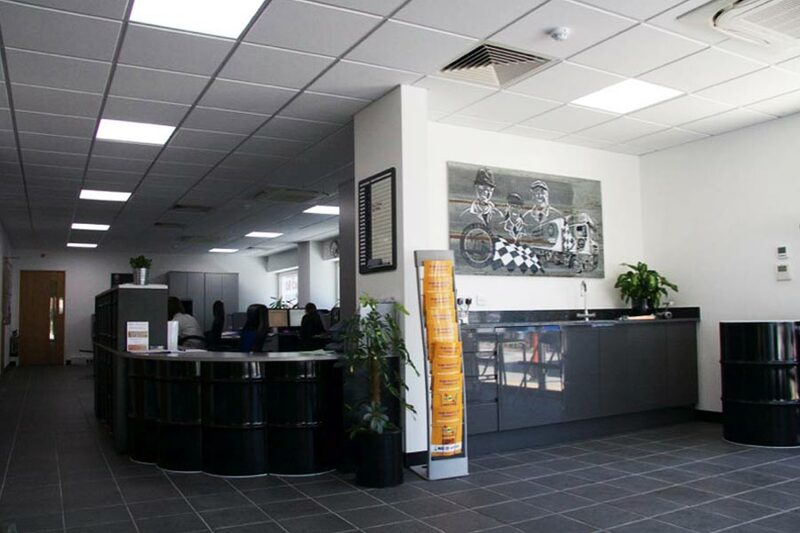 The underfloor heating pipework was installed by H2ecO with a standard screed covering in the office building. Work was carried out over weekends to minimise disruption of the main contractor’s established schedule. The two systems would have been capable of “fighting” each other so H2ecO devised an interlock control for each zone to ensure the systems would not compete. This method was a first for Daikin UK and one they may use in future elsewhere. The VRV Heat Recovery system, with an 8hp condensing unit and six-way multi BS box, uses Daikin FXFQ-A Roundflow cassettes and FXZQ-A 600 square four-way blow cassettes to provide mainly cooling (best done from above) but they are also able to provide quick response heating if required. This latter was an extra part of the brief as the client wanted to allow for a Christmas shutdown of two weeks where the building temperature would be allowed to fall significantly to save energy but then be warmed up quickly when the facilities reopened. UFH systems are not fast response so could not meet this part of the heating brief alone. The system controls allow the UFH powered by the RHI eligible Daikin Altherma unit to provide most of the facility’s heating demand – more than 98%. This means the client can claim RHI payments for most of the space heating and domestic hot water. At the same time, the Daikin VRV system provides an additional layer of fast-response heating – alongside humidity control and cooling when required. The VRV Heat Recovery technology also allows efficient, economical transfer of ‘waste’ heat from warm areas to colder areas – rather than simply wasting it to the atmosphere. 2. Maintain a healthy, productive workspace. The client expressly wanted to avoid the example that most of us have experienced – rooms that make everyone drowsy when they have been full for a period of time and the CO2 levels start to rise because there is no fresh air provision. In addition to the heating and cooling equipment, H2ecO specified and fitted a Daikin Heat Recovery Ventilation system for the main spaces. This allows the extraction of stale, warm air and the return of fresh air – pre-heated in a heat exchanger. This is vital to the provision of high quality air with normal CO2 levels in busy rooms. The meeting room, which is a relatively small space with significant solar gain and can be very densely occupied, has been a particular success: even when the room is full, both the temperature and air quality remain excellent. Although a Daikin Heat Recovery Ventilation system can be operated autonomously, H2ecO specified that the Anglo America Oil Company unit be linked to the rest of the development via Daikin’s i-Touch Manager – intelligent central control system – which allows the setting of seasonal profiles to maximise efficiency. 3. Underfloor heating in a workshop with structural high load slab. This requirement raised most eyebrows with the main contractor! 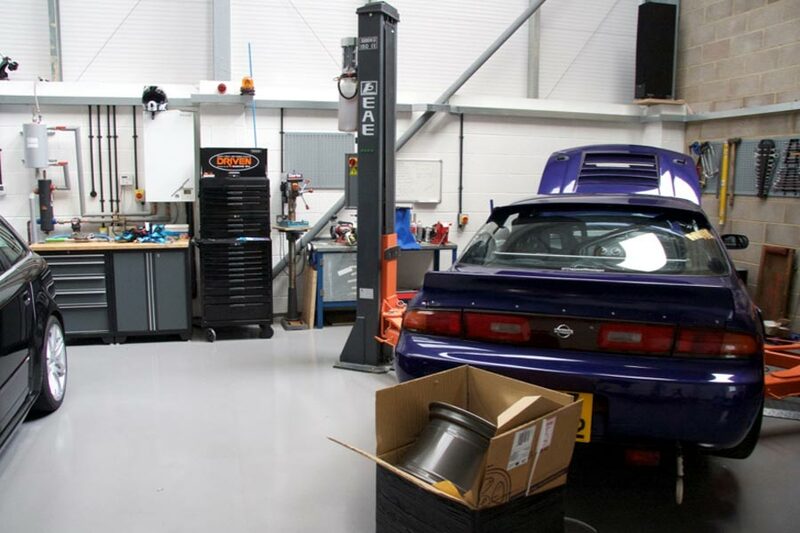 The workshop was to be used as a storage and workshop area with a 2 post 5 tonne car/van lift and had a full height roller shutter external door. The brief required Underfloor heating so that workers lying on the floor to work on vehicles would not get cold. The floor slab had to be structural and able to take substantial loads. Equipment had to be bolted down to it and the heating system had to be able to cope with the opening and closing of the large area roller shutter. The solution was to install a floor slab with 100mm of solid insulation under the reinforcing mesh and then fix the UFH pipework at smaller than normal centres to the reinforcing mesh to allow more rapid heat transfer. The concrete slab was then applied with a minimum thickness of 150mm over the pipework. The known position of the vehicle lift floor fixings was avoided with the UFH pipes allowing them to be fixed to full depth. The result has been a slightly surprising success. The RHI-eligible 16kW Daikin Altherma heat pump has coped in line with calculations and the fact that the slab has such a large thermal mass means that opening and closing the roller shutter door has a minimal, short term effect on the temperature of the building. The warm floor is a resounding hit with staff who don’t suffer with cold feet and legs (or backs) even in the depths of winter. A post-installation survey with H2ecO’s FLIR camera has shown an almost completely even spread of heat through the thick concrete slab rather than the individual pipes emissions that can be seen through a normal thickness screed. The thickness of the slab has not adversely affected heat flow into the building due to the insulation below and actually seems to have acted positively to stabilise temperature fluctuations. This was a major concern for H2ecO when the client approached the company. Main contractors typically have an established pool of sub-contractors who they know and trust. Having a new sub-contractor imposed on them by a client – especially quite late in the design stage – is not usually a good recipe for a stress-free project. Having identified the potential issue, H2ecO made a particular effort to develop a close working relationship with the project manager and the site agent. This went well beyond the usual provision of statutory paperwork and method statements etc. H2ecO’s flexible work ethic and an understanding that by being brought in late in the development process it would have to work round the existing timetable helped to smooth any issues raised by the additional works required compared to a ’standard’ build of this type. At the same time it has to be said that Jade Aden’s site team was excellent – and became genuinely interested in the technologies and systems being fitted into the building. The end result was a very smooth development process with no scheduling or specification problems at all. 5. Minimising demand from the grid. The heating and cooling technologies selected for the project were the most efficient available at the time but they still require electrical power to operate. In order to offset as much of the electrical demand as possible the project was equipped with a 30kWp Solar PV array. Due to the schedule, there was not time to get a full National Grid approval in advance so the client took the decision to install but not connect the array at risk (so that the installation could dovetail with the main build schedule). The National Grid approval was subsequently gained and the system connected. The Inverter system chosen was a Solar Edge system which provides panel-level monitoring and the ability to link with the TESLA battery storage system should the client decide to use such a technology in future for grid failure protection. PV Predicted energy production = 24,950kWh using Government standard SAP methodology. Result is 20% ahead of predictions. The renewable element of the heat produced is about 75%. At the non-domestic RHI rate of 2.57p/kWh, the heating would actually cost Anglo American Oil Company just 0.6p/kWh for 20 years if they were paying for the electricity from the grid. Better still, the electricity comes from roof-mounted photovoltaic panels that produced more that 30,000kWh of electricity during the review period. With photovoltaic generation taken into consideration, Anglo American Oil Company is effectively running its heating systems in the office and workshop for free over the next 19 years. And as the systems consume only 10,200kWh of the 30,000kWh produced, electricity costs over the whole site are significantly reduced – with potential for income from exporting surplus capacity to the National Grid. We used a steel volumiser vessel with the heat pump water circuit. Even when properly inhibited, it colours the water, which affects the visibility of the flowsetters on the UFH manifold. H2ecO now uses bespoke stainless steel volumisers manufactured in the UK to prevent this. The room housing the Hydrobox, DHW cylinder and Solar PV inverters was initially specified to be a store room and as such was not temperature controlled. It was later decided that it would house a computer server. The room was inadequately cooled for a server and a retrofit cooling solution had to be added. In future, it will be made very clear at the start of the design process that the room containing the key components will either be warm or will need specific cooling. Try to get involved earlier in the process!